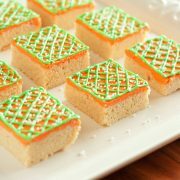 I just can’t get enough of the sugar cookie squares! Yesterday I was making the original Sugar Cookie Squares with Vanilla Frosting and was thinking of what other combinations would be good with these squares. 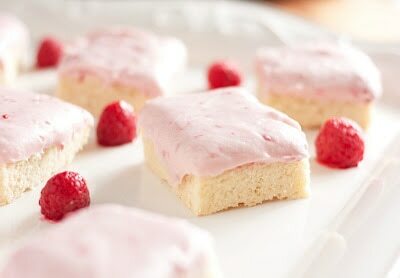 The best that came to mind, these Sugar Cookie Squares frosted with decadent White Chocolate Raspberry Cheesecake Frosting. They basically melt in your mouth while the combinations of sweet yet tangy cream cheese with natural berry goodness tantalize your taste buds. White Chocolate Raspberry Cheesecake is one of my favorite desserts so I thought this would be a great combination of cookie and cheesecake. Let me tell you it most definitely is! 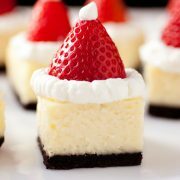 The great thing about these is that you get the cheesecake flavors without waiting 9 hours for a cheesecake to bake then set in the refrigerator. The cookie portion of this recipe is so incredibly simple, that is one other reason it’s one of my favorites to do variations on. I hope you enjoy this version as much as I do! Also, this frosting would be incredible on a vanilla, chocolate or angel food cake, just keep in mind it has a slightly runnier consistency than your average butter cream frosting so it not ideal for piping. 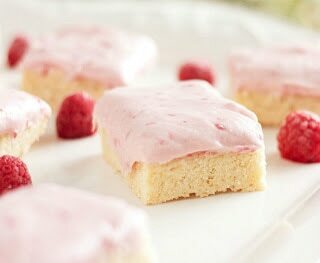 Soft melt in your mouth sugar cookie bars with a bright and creamy raspberry frosting! Prepare cookies according to directions listed and allow to cool completely. 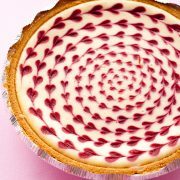 Frost with White Chocolate Raspberry Cheesecake Frosting (note: for cleaner cutting, if desired, cover pan with plastic wrap and freeze bars for 15 minutes to help frosting set). Cut into squares and store cookies in an airtight container. In a large mixing bowl, using an electric mixer, whip together cream cheese and butter until smooth and fluffy. In a microwave safe bowl, combine white chocolate chips and cream, melt mixture in the microwave on 50% power in 30 second intervals, stirring after each interval until melted and smooth. Add melted chocolate mixture to cream cheese mixture and blend together with electric mixer until well combined. Add in powdered sugar and mix until well blended. Fold in raspberry puree. *This is about 3/4 cup fresh or frozen raspberries processed in a food processor. Note, if you are using frozen raspberries measure them before thawing, then thaw and process in the food processor. Follow link HERE for sugar cookie bars. Jaclyn: Thanks Namitha for your response to my question! I love your blog!